The foundation of the Church of Christ is revelation (communication with God). The organization of the church always includes an Apostle and Prophet at the head. Jesus was an Apostle, Prophet, and High Priest. Peter stood at the head after the death of Jesus. Paul took his place among the twelve. When the Christians turned heathen again, there were no more Apostles and Prophets; and God never spoke again to the Gentiles; until the restoration by Joseph Smith in 1830. Paul also told us in 1 Cor. that those who feel called to the ministry must wait until called of God through one holding that priesthood. “And no man taketh this honour unto himself, but he that is called of God, as was Aaron.” (Heb. 5:4) Aaron was called to the priesthood through Moses; who held that priesthood from God. Until we have all “come in unity of the faith” and have become “perfect,” these offices will continue to exist. Without the required organization and gifts of the Spirit, the Church of Christ cannot exist. There are only two orders of the priesthood mentioned in the Bible: (1) Levitical (Aaronic), and (2) the Melchisedec. The Melchisedec Priesthood has existed since Adam. It administers is spiritual affairs and the government of the Church of Christ; and is endless. There are two degrees in this priesthood: Apostle and Priest. There are four degrees of Apostles and two of Priests. These were foreordained as sons of God before the foundation of the earth; and their priesthood is endless. After Elijah had been translated (in effect taken out of this earthly realm), he ordained Elisha to the same office of the priesthood. As Elijah stood at the head of the Church of Christ, he could not ordain Elisha until after death. As Elijah was leaving in the fiery chariot, he ordained Elisha. (2 Kings 2:9) This could only have been possible if Elijah still held the priesthood. Once bestowed it remains in eternity; unless regularly taken away. The Levitical priesthood administers in temporal affairs and is a priesthood of life. There are three orders in this priesthood: Priest, Teacher, and Deacon. It came into use after the rebellion of Israel at Mount Sinai; when Aaron and the tribe of Levi stood against the rest of Israel. Aaron and the line of first born sons held this priesthood to the exclusion of the rest of Israel. A primary responsibility, until Jesus, was the administration of the added law of Moses. This priesthood was limited to temporal duties. The only exception is authority to baptize by water. The highest office in the Levitical Priesthood, that of Priest; and is holds this authority. This is evident in the case of John the Baptism. He was the son of Zacharias, a Levitical Priest. This priesthood is also called the Aaronic Priesthood, after Aaron. It continued from Aaron to Jesus through the line of first born sons. It includes the offices of Priest, Bishop, Teacher, and Deacon. The first thing Jesus did when He began His ministry was to go to John the Baptist. Why? John was a Priest of the Levitical Priesthood. This is the highest authority in that line of priesthood. The office of Priest in that order had authority to baptize with water; but not with the Spirit. There have been three degrees in the office of Apostle. Moses held the highest office as first degree Apostle; and passed a lower office to Joshua (Num. 27:18). Joshua, holding this second degree, was responsible for the government of the people after the death of Moses. Jesus bestowed the office of third degree Apostle on the twelve. They held no authority over the people as a whole. Their responsibility was to preach the gospel to the lost sheep of Israel. Later, after the crucifixion, they were Ambassadors of the gospel to the nations of the world. The highest office, a first degree Apostle, is noted in the Bible as that of Apostle, Prophet, and Lawgiver. Moses held this office; as did Jesus. Moses passed a part of his authority to Joshua, who was a second degree Apostle and held the office of Prophet; as were others after him. Both first and second degree Apostles hold authority over the church and the people as a whole. After the death of Jesus, Peter was ordained to a higher office; and held authority over the church. That left only ten third degree Apostles. Matthias was chosen by lot “and he was numbered with the eleven apostles.” (Acts 1:26) The twelfth position was filled by Paul; who was called directly by Jesus. Peter, as head of church, addressed his epistles to the church. The twelve were third degree Apostles. They held authority over specific jurisdictions. Paul addressed his epistles to churches in his jurisdiction. The office of first degree Apostle stands above, and holds every other office, of the priesthood. It is necessary to restore and stand as head of the Church of Christ. Moses, Jesus, Joseph Smith, and James J. Strang all held this office; as did many others in the Bible. They are Apostles, Prophet, Seer, Revelator, Translator, and Lawgiver. A second degree Apostle has often stood at the head of the church. He is a an Apostle, Prophet, and Seer. Joshua succeeded Moses in this priesthood. His duties are involved with the administration of the church. He can provide guidance as a Prophet; but, cannot give laws and revelations to the church. Third degree Apostles are Ambassadors. These are given specific jurisdictions within the church. Their chief duty is preaching the gospel in places where it has not gone. It does not appear this degree of priesthood was used prior to the twelve under Jesus. The twelve were first instructed to preach the gospel to the lost sheep of Israel. After His crucifixion, they were given jurisdiction over the nations of the world. They hold royal authority in the places and churches they are sent; but not over the Church of Christ. There are two degrees in the office of Priest of the Melchisedec Priesthood. A first degree Priest of the is called a High Priest. There were many in the Old Testament that held the office of High Priest. Jesus, by virtue of the higher office, was also a High Priest. Those who hold this office are also called Sons of God. It was held by the first born sons from Adam to Israel (Jacob). In the New Testament this office has been confused with senior members of the Levitical Priesthood; who were called Chief Priest and High Priest. The kingdom of God co-exists with the church; but the church does not always co-exist with the kingdom. The kingdom of God exists all of the time (spiritually); but, is only open to man when there are authorized officers to administer gospel ordinances. The church can exist only when all of the required offices are filled; especially those of Prophet and Apostle. These hold all lower offices. When Prophets and Apostles cease to be called by God, the Church of Christ ceases to exist. John was the last of the Apostles. It is believed that he died in Ephesus in 99 AD. God no longer spoke to man. The Church of Christ cannot exist without communication with Christ. Revelation is the sure foundation upon which the church is built. Without continued revelation, the church was gone; as John foretold. The Church of Christ was taken from the earth for 1,260 years. Who was the dragon and the beast that destroyed the church? None other than Rome. “And here is the mind which hath wisdom. The seven heads are seven mountains, on which the woman [church of Satan] sitteth.” (Rev. 17:9) Only Rome has synonymously been known as the city of seven hills. One by one, Rome murdered the Apostles. James (the major) was beheaded in 45 AD. Philip was stoned to death in 54 AD. James (the lesser) was stoned and clubbed to death in 63 AD. Mark was dragged to death in 64 AD. Peter was crucified upside down in Rome, at Nero’s order in 69 AD. Paul was beheaded in Rome, at Nero’s order in 69 AD. Andrew, Thomas, Matthew, and Matthias were martyred in 70 AD. Luke was hung from an olive tree in Greece in 93 AD. It is believed John died in Ephesus in 99 AD. First, Satan destroyed the Apostles and the Church of God. Next, he destroyed the rest of the Melchisedec Priesthood. Finally, he destroyed every saint of God. It is estimated that Rome (including the Catholic church) was responsible for 50,000,000 martyrs. Since the Catholic church has placed its credence on divine authority through a line of Bishops, it is necessary to address that office. The office of Bishop is an office of the Levitical Priesthood. Only the firstborn sons in the lineage of Aaron hold a right to this office. It is not an office of the Melchisedec Priesthood; and therefore ministers only in the temporal affairs of the church. This claim of Peter being the first pope in Rome, and there being a continuous succession of such bishops has three flaws. First, the office of Bishop has no divine authority to administer the saving ordinances of the gospel; and cannot stand at the head of the church. Second, Peter was not a Bishop; but, an Apostle. Third, there was no pope in Rome until the sixth century. Even then, there was not a continuous succession of popes. All priesthood was lost in the Christian church by the fourth century. In 325 AD, the unbaptized, pagan Roman Emperor Constantine stood as the absolute head of the church. Constantine usurped authority of God. He became the supreme head of both the Pagan Roman Empire and the new pagan Catholic Church. “Immediately upon coming to power as the sole ruler of the empire, but only then, Constantine asserted the right to exercise ABSOLUTE AUTHORITY OVER THE ENTIRE CHURCH.” (Constantine’s Sword, p. 188) His authority was the sword. No claim can be made for Constantine receiving authority from God, to stand at the head of the church. He was not even baptized until his death bed. The stream can rise no higher than its source. With the Catholic church having lost all divine authority, the Protestant churches could not rise any higher. Martin Luther’s response to having no authority was to claim salvation was possible only by faith. This doctrine did not really get a foothold until about 1800. The complete world of catholicity can make no legitimate claim to divine authority to administer the ordinances of the gospel. Every time they act “in the name of the Father, the Son, and the Holy Ghost,” they usurp the authority of God. Baptism by one not holding divine authority is no more effective than an ordinary bath. Jesus went to John for baptism because John held divine authority to baptize Him with water. Jesus then ordained twelve Apostles and commissioned them to preach the gospel (Mark 3:14). The Twelve Apostles then ordained elders in every city; so divine authority would exist every where they went (Acts 14:23). Joseph Smith has been the only man to claim such a restoration. 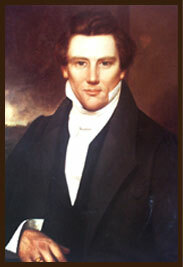 He organized the Church of Christ on April 6, 1830. As Prophet and Apostle he stood at the head of church. The church had the same organization that existed in the days of Jesus. The foundation of this restored church was revelation. The Church of Christ could only be restored through communication with Christ. He claimed restoration of the priesthood through administration of angels sent from God. All former divine authority had been destroyed by Constantine; when, as unbaptized, pagan Roman Emperor, he stood as the absolute head of the church. The stream can rise no higher than the fountain. Joseph taught the same gospel as Jesus and the Apostles. Baptism had been removed from Christianity for at least 1,200 years. Without any divine authority, baptism by water and the Spirit could only be restored through a restoration of the priesthood. These commandments included those given to the former day saints. “17 Wherefore come out from among them, and be ye separate, saith the Lord, and touch not the unclean thing; and I will receive you, 18 And will be a Father unto you, and ye shall be my sons and daughters, saith the Lord Almighty.” (2 Cor. 6) Like the former day saints they were to have things in common, gather, and be as one. Most would not. Like the rich man, it requires great sacrifice to give up the delights of the world. Of the estimated 200,000 people that were baptized, only a few thousand ever gathered. When a people bind themselves to God in the everlasting covenant to be His people and obey His laws, they enjoy either the blessings for obedience, or the curses for disobedience (see Deut. 28). They failed. Joseph Smith was murdered on June 27, 1844. A new hope and light appeared. 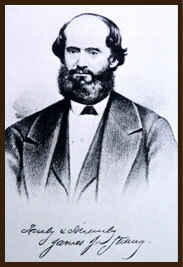 James J. Strang claimed appointment by Joseph Smith; and a calling and ordination at the hands of angels (the same as Joseph). Both of these are given as essential to standing at the head of the Church of Christ. Unless called and ordained under the direction of Christ, one cannot stand at the head of His church. We have already demonstrated that divine authority was lost after the Apostolic Church. Protestant churches could not claim something their mother had not. The first test of whether a person holds a valid office in the priesthood is the required claim to being called and ordained according to the law of God. None can question the calling of those in the Bible. Joseph Smith claimed an ordination at the hands of angels; as a first degree Apostle in 1829. Joseph was murdered on June 27, 1844. At the very moment of his death, James J. Strang claimed to have been ordained, the same as Joseph, at the hands of angels. Over a week later he received a letter that Joseph had written before his death appointing him as head of the church. After the death of Joseph Smith, on August 8, 1844, Brigham Young claimed there would be no successor to Joseph. He claimed the twelve had authority to stand at the head. “Let no man presume for a moment that his [Joseph’s] place will be filled by another; for, remember he stands in his own place, and always will; and the TWELVE APOSTLES of this dispensation stand in their own place and always will, both in time and eternity, to minister, preside and regulate the affairs OF THE WHOLE CHURCH.” (Times and Seasons, Vol. 5, p. 618) By what revelation were they called to such authority? The only Lawgiver they recognized was dead. Again, the people were given similar commandments to gather and to be as one. And again, the people were slothful and cared more for the delights of the world than for rewards in heaven. The Church of Christ had been lost again. The only place we can find even a claim to the Melchisedec Priesthood is through the restoration by Joseph Smith and James J. Strang. They were both murdered and the Church of Christ lost. We must look to the history of the Strangites to discover if any such priesthood remains; as it did after the death of the Apostles and loss of the Apostolic church. In 1961, one group of Strangites reorganized their church into a corporation. A corporation is a “fictitious” entity that exists only in the mind of the civil law. When an organization incorporates, they give up their former identity. Many do this for the limited liability; as they exist only as a corporation. The stockholders are no longer individuals; but, are only members of the corporation. The Church of Christ had never been incorporated under either Joseph, or James. The church is the bride of Christ. They established a new order of priesthood to rule over them; and use the corporation by-laws to govern them. They have forgotten their first love; and prostituted themselves to the government of man. They are now priests of man. Vernon Swift stands as the man-made President of their church; as Constantine stood over the Christian church. John wrote the words of Jesus to the church of Ephesus; on account of such an error. They became aligned with paganism. Jesus advised them to either repent and be re-baptized, or their candlestick would be removed. The rest of the followers of James J. Strang have worked to remain faithful and obedient to the laws of God; and remember always their first love. The office of elder remains among them. My priesthood is five generations removed from the ordination of James at the hands of angels. James ordained L. D. Hickey, who ordained Wingfield Watson, who ordained Samuel Martin, who ordained Lloyd Flanders, who ordained me an elder on July 8, 1856.